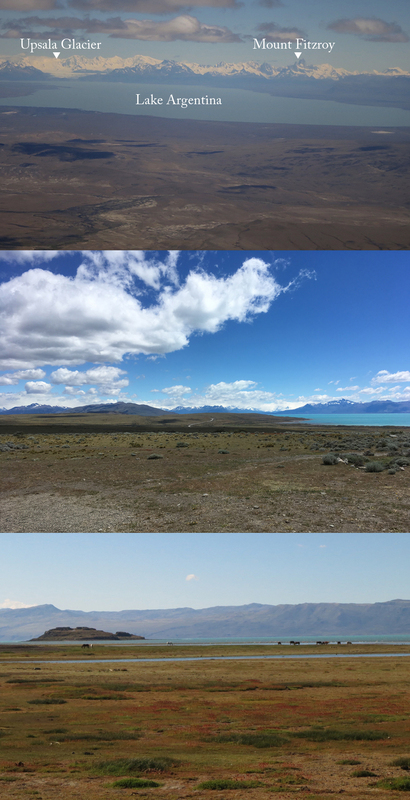 About halfway into my Argentina adventure, I made a side trip to Patagonia, spending three days in El Calafate in the Andes mountains on the edge of the Argentine/Chilean border. 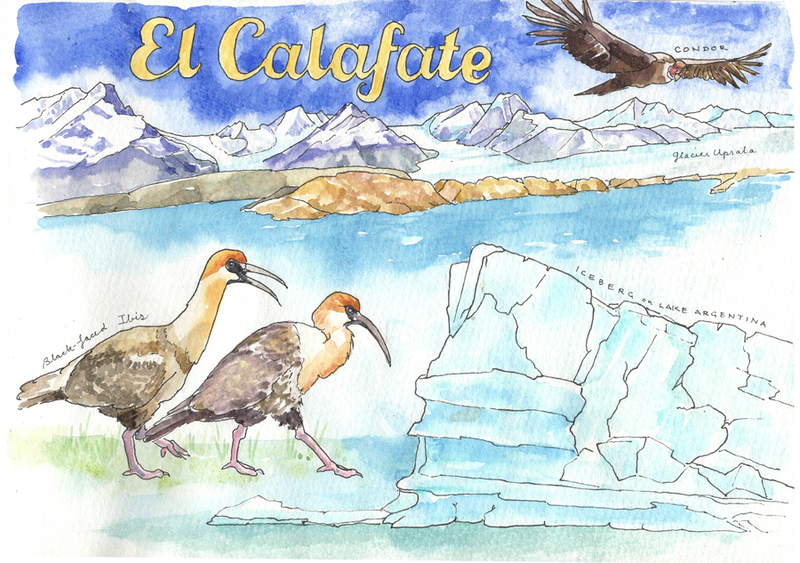 I flew from Buenos Aires, and coming in to land at El Calafate, could see some of the highlights of the region. The group of glaciers that are clustered here make up the third largest chunk of frozen fresh water on earth, after that of Antarctica and Greenland. 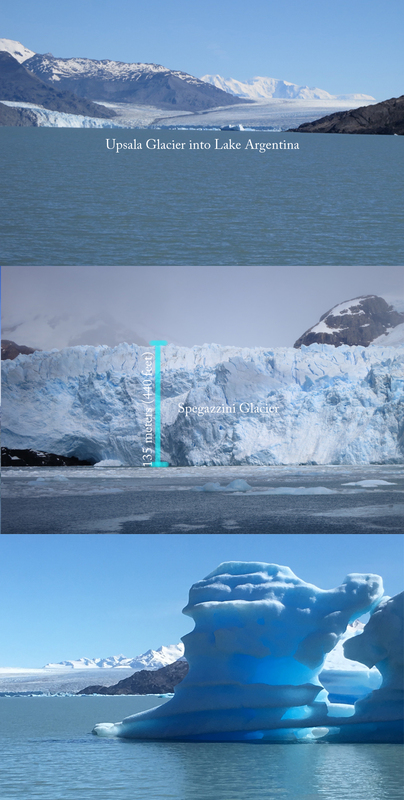 I don’t need to depress you with data on the dramatic shrinking of these glaciers. Having an afternoon free before taking the organised tours the next day, I went to the handsome Glaciarium Museum, where I learned about the formation and movement of these ice fields. It was handy, before setting out to visit the Glacier National Park, to know a little bit. The glaciers I saw are part of the Southern Patagonia Icefield, the entirety of which measures 13,500 square kms (5,200 sq miles). 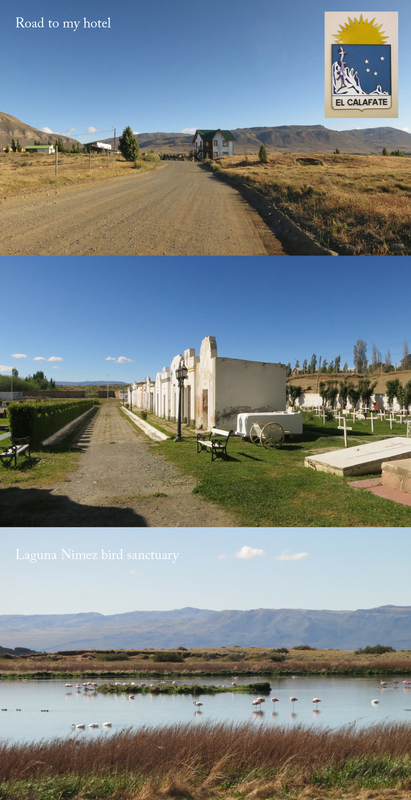 My hotel was on a dirt road not far from a delightful bird sanctuary, which I could visit after my day’s excursions. Tame dogs roamed around all over the village, which had only hiking gear stores and other tourist-oriented shops. This was peak season (their late spring/early summer) yet I never felt the pressure of too many tourists. I was also close to a great little museum which had in-depth information of the indigenous Tehuelche indians of the region, and their tragic genocide. The first Europeans (Magellan) to visit Patagonia (they named the region after the tall inhabitants’ large feet) in the 16th century decided these people were of inferior merit, and ever since, they were systematically pushed out, when not downright hunted or killed by European diseases. The next day I was driven to a boat, which took me and my fellow tour companions to an inlet off Lake Argentina, from which we headed to the top of a hill from which we could see the Upsala glacier, along with the 3 other glaciers that merge into it. 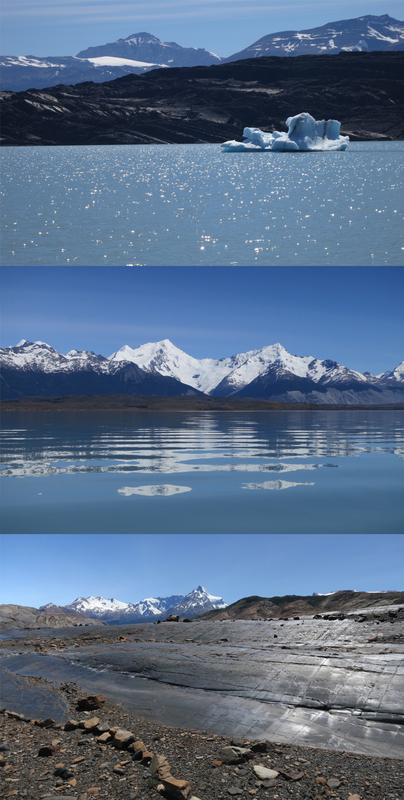 A lagoon that had recently emerged due to the melting of these glaciers was the most amazing pure cobalt blue. We hiked a bit and saw all around the geological evidence of glaciers having scraped by: the sedimentary rocks that mostly form these mountains are often polished shiny. We also saw some fossil remnants of the sea that used to cover much of what is now Argentina. In the afternoon, we descended to Estancia Cristina, once a working sheep farm; now a lodge for a few scientists and a museum within the National Park. Back in the late 19th century and early 20th century, the Argentine government, which had hijacked Patagonia in 1880, was giving away parcels of land (a working ranch is called an estancia) if you could prove your commitment by staying put and working there for 5 years. 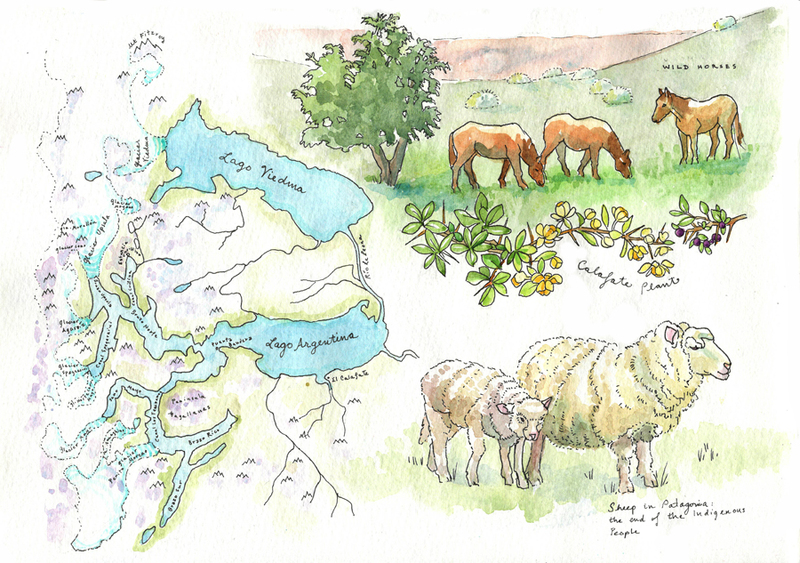 Many English immigrants like the Masters, who built Estancia Cristina, took advantage of this program, bringing their husbandry knowledge and great herds of sheep to Patagonia. The climate is very harsh. East of the Andes is very like the eastern Sierras, where the mountains stop precipitation from watering the land. Terrible winds whip around and it is never warm. I couldn’t believe the desolation the Masters family endured. They established the estancia (completely relinquishing shepherding by the 1970’s) from scratch in 1913. Only when radio became available were they able to have real contact with anyone else. At the time, it took 14 hours one way to get to Puerto Bandera, from where we had launched. Charming as the Estancia seemed, and one has to admire the family’s fortitude, sheep and cattle farming devastated the fragile indigenous vegetation. The National Park has now prevented humans from raising domestic animals anymore, but there are still escapees (wild horses and even wild cows manage to survive out there) which wreak havoc on the struggling Patagonian forests. Our guides were cheerful and knowledgeable. One pointed out the Calafate plant which bears berries in late summer. There not being a whole lot of vegetation around there, the Native Americans would benefit from their vitamin C. I was impressed with our guides’ devotion to the Estancia, and their desire to stay behind at the desolate ranch rather than coming back with us to El Calafate. Next day I did more boating around the Lake and it’s straits, getting a close up look at icebergs and the façade of Glacier Spegazzini. From the boat, we were treated to other beautiful colours—the electric cyan of the icebergs that calved off Upsala and the milky jade of the lake (the milkiness is due to suspended sediment dragged down by the glaciers). Looking at the barren cliffs that lined lake we could see a little bit of Andean forest at lower altitudes. It was interesting to learn that the 3 varieties of trees that live there share a common ancestor with the trees that covered the ancient continent of Gondwana. The walls of the lake did not look like a hospitable place. The only life we saw was a few soaring condors riding the updrafts of the cliffs. My reliable tour company, Designer Trips arranged for my pickup to take me on to the next phase of my Argentine adventure: Terra del Fuego!